The modern wave of the NBA is coming like an avalanche. Three-pointers will be hoisted relentlessly, teams will constantly run in the fast break and the players at each position are getting smaller, faster and more skilled. But on this night in the NBA, the Thunder utilized its own group of modern NBA players to play an old-school bully ball style that obliterated the personification of that pace-and-space style, the Houston Rockets. Starting on the first three possessions of the game, the Thunder exploited Houston’s play to switch every screen from the point guard to center spots. The result was three consecutive post ups for Steven Adams, isolated on Houston’s James Harden, who could do little to deter the hulking Thunder center. First Harden had to foul, then Adams spun and attacked the rim for two. On the third, Adams waited for a predictable double-team to come over and found a cutting Terrance Ferguson on a backdoor cut. Adams’ bully ball style was contagious, as the Thunder was able to play physically without fouling in addition to dominating the glass to the tune of 52-39. Against the Rockets, who spread the floor with the best of them, the Thunder was able to keep the ball in front for large swaths of the game, recover back into the paint to the roll man on screen and rolls and then get out and contest on the perimeter. The result was a suffocating defensive effort that forced Houston into 37.8 percent shooting including 11-for-42 (26.2 percent) from three-point range with only 10 free throw attempts. Make that 7 in a row. The two Western Conference contenders traded runs throughout the first half, including bursts of 12-4 and 10-0 for the Thunder in the first quarter. Bursts of 10-2 and 17-7 got the Rockets back into the game, but the Thunder broke this one open when the starters, and specifically Paul George, re-entered late in the second. George went 6-for-6 in that frame for 14 points on a variety of jump shots from both behind and inside the arc, helping the Thunder close out the half on a 23-8 run to build a 14-point halftime lead. Though it wasn’t a perfect second half, the Thunder was hardly threatened after halftime, and indeed its lead never dipped below 11 over the final 24 minutes of this one. With the score 66-55, the Thunder got one of a number of curling jump shots from George off a dribble hand off from Adams, a pair of free throws and then a beautiful three-point play as Adams snagged an offensive rebound and dished to a cutting Jerami Grant for a dunk layup plus the foul. The 7-0 spurt was the precursor to an eventual 25-point lead as the Thunder cruised to a 98-80 victory. 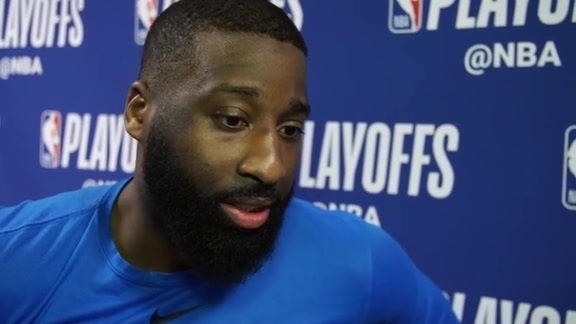 With Russell Westbrook sidelined with a sprained ankle, the Rockets rested since Monday and the Thunder coming off a game just 24 hours beforehand in Cleveland, the excuses could have easily piled up for the Thunder. Instead, Donovan’s club were the aggressors, just lining up and accepting every match up and using swarming extra efforts on the perimeter to harass Harden and Chris Paul, then help-side rotations to blow up scoring chances around the rim. George was the ringleader, making a season-high six steals to go with his 20 points, 11 rebounds and 6 assists. George was one of six Thunder players who scored in double figures, including all five starters and reserve point guard Raymond Felton, who filled in nicely in Westbrook’s absence. The revelation tonight was Ferguson, the springy guard who struggled with some confidence early in the season, only to be encouraged by Westbrook and George and unleashed on the Rockets tonight. Ferguson’s quick feet, length and boundless energy spread all over the court tonight as he closed off driving lanes, circled back into plays for a massive block at the rim, plus another steal. He was decisive and certain in his movements, and in particular his jump shots. Left open by a sagging Rockets defense, Ferguson nailed 4-of-9 three-point shots on his way to a season-high 14 points. Though Westbrook’s return is on the horizon, the Thunder is proud of the way it has responded on this back-to-back in comparison to the opening two games of the season without their perennial All-Star point guard. 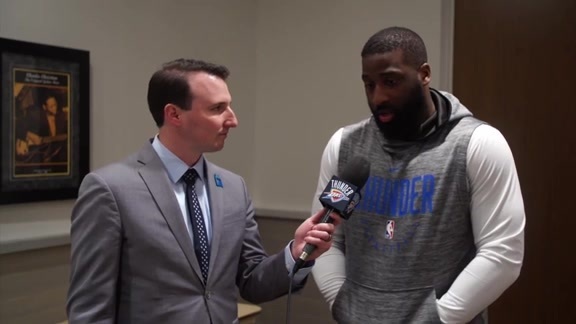 It’s a sign of the 7-4 Thunder’s connectedness and firm identity, one it will keep developing as it tries to extend this win streak to eight on Saturday in Dallas.